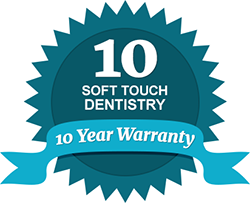 At Soft Touch Dentistry, we utilize some of the highest quality of dental materials for our patient care during cosmetic dental treatment. It’s small details like these that truly impact the overall appearance of the services we provide. Dr. Sarah Thompson believes that beauty and function should go hand in hand, without compromising the integrity of your smile. Smaller than crowns, inlays and onlays can restore a large portion of your tooth’s structure while still maximizing any remaining, healthy enamel. Sometimes called “three-quarter crowns,” inlays and onlays take restorative therapy just one step further when it comes to minimally invasive care. The treatment process is similar to a traditional crown, with the inlay/onlay made in a laboratory. If a tooth is badly damaged so that it can no longer support normal use, a full coverage crown will preserve its function. Making the crown out of porcelain also returns aesthetics to your smile. Crowns allow your tooth to function normally again; they are also used over teeth that have been treated with root canal therapy. Modern porcelain crowns are durable to be placed anywhere in your mouth, so you’ll never have to worry about a metallic restoration showing when you talk or smile. Porcelain veneers give your smile an instant makeover, correcting minor irregularities such as teeth that are chipped or worn. Each thin facing is applied to the front of your natural tooth, giving the illusion of an entirely new tooth in its place. Which porcelain restoration is the right one for you? We invite you to contact Soft Touch Dentistry to find out more about our services and to schedule a private exam with Dr. Thompson.